In cases when employment carries significant levels of trust and influence, the need for employment risk assessment may extend beyond the norm in order to ensure liability protection for the employer. 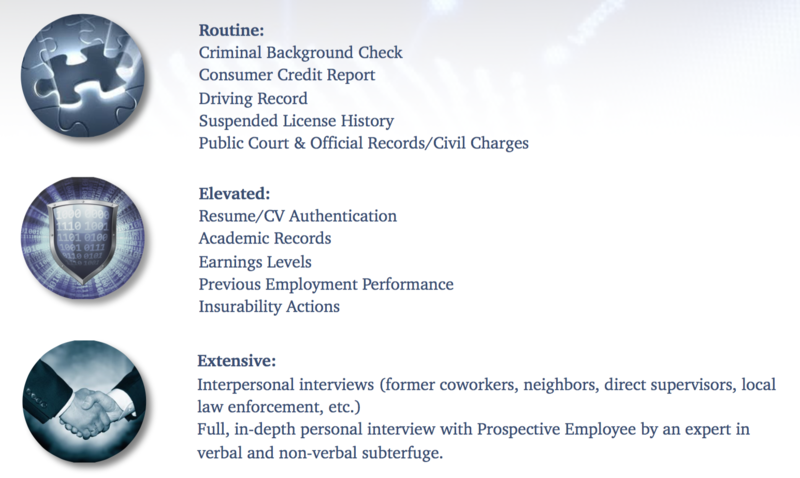 A routine background check identifies any past legal indiscretions which may disqualify candidates from employment, while an extensive background investigation can offer a fully composed insight into the past experience and behaviors (ethically and financially) of prospective employees. This insight allows employers the ability to make solid predictions about how an individual is likely to perform in a given role. Executive Defense Team, LLC offers a full scope of employment risk assessment and background verification. The search items listed here are examples of a broad range of options which can be tailored specifically to the hiring employer and the prospective employee.